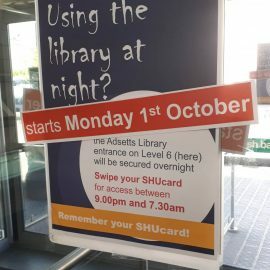 From Monday 1st October, to improve your safety and security in the Adsetts Library and to reduce incidents of antisocial behaviour in the building entrance, we are introducing SHUcard only access at night. This means the doors on Arundel Gate will be secured at night from 9.00pm until 7.30am and you will need your SHUcard to swipe for entry. Just present your SHUcard to the card reader located on the barrier between the doors to come in and press to exit on the way out. Remember if you forget your SHUcard during these hours you can always study at Collegiate library. Please note that you will not be able to use a temporary day pass to do this. It has to be your SHUcard.